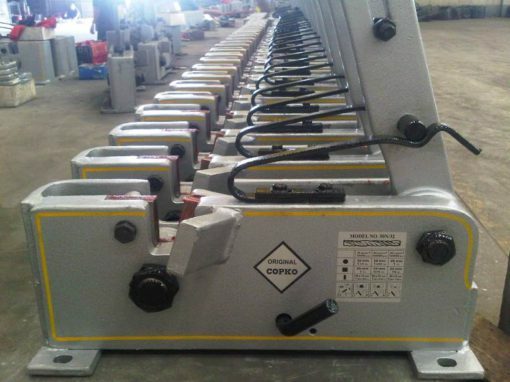 The formed body welded box-type is of study construction due to SM steel plates. These cutters are equipped with study and well dimensioned gear lever transmission which transmits the force directly to the shear part. The slide holding the shear blade is precisely guided between body plate to prevent it being forced out of line. This system not only keeps the frictional losses to a minimum but also gives the machines a high degree of efficiency so that optimum use is made of the operator’s effort. 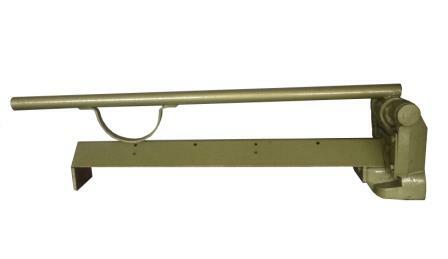 The hand-levers on all models, when in basic position, are securely held by a retaining spring to prevent accidental falling. Very economical and labour saving job-site equipment, indispensable modern building technology. Subject to design alterations for improvement. 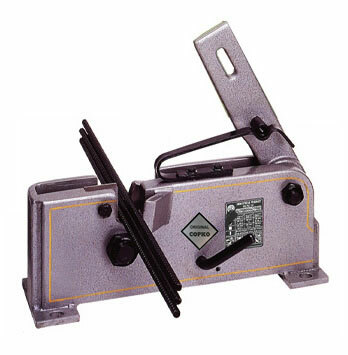 The model 50N/22 has 2 adjustable shearing, and model 50N/28, 50N/32 have 3 adjustable shearing jaw clearances which can be easily set to the thickness to be cut by means of the lever located on the left side of the cutter. Round 22 mm. 28 mm. 32 mm. Square 20 mm. 24 mm. 26 mm. Flat 35 x 10 mm. 40 x 16 mm. 45 x 16 mm. Size of blade Length 35 mm. Length 45 mm. Length 50 mm. Approx. weight 13 kgs. 29 kgs. 39 kgs. 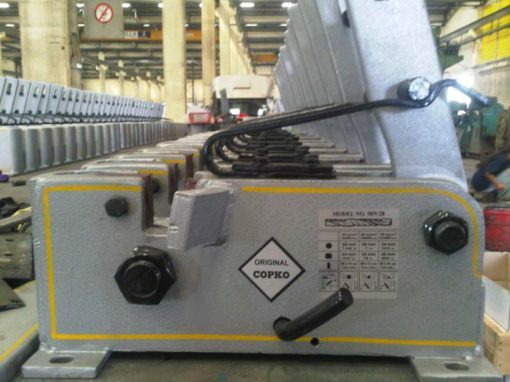 This model is designed for cutting reinforcing bars particularly Ribbed and ‘TORSTEEL’ Bars of bigger thicknesses. It is equipped with a ratchet and pawl device so that the cutting clearances can be easily set to the thickness to be cut and cutting can be effected with a minimum of effort. The shear slide is brought up to the materials by means of the ratchet lever to enable immediate cutting by the first lever movement with thick and thin reinforcing bars. Constructed from distortion-free SM steel plate makes it resistant to rupture ensuring an unlimited life. Transmission of force directly to the shear part through sturdy rack and pinion arrangement ensures effortless clean burr-free cutting and contributes to the easier operation of the machine. 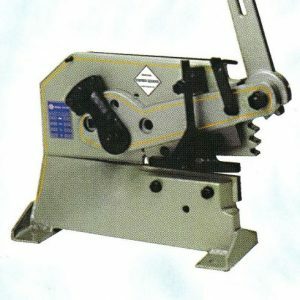 The machine is fitted with the best quality cutting blades which have two cutting edges. Subject to design alteration for improvement. This model is equipped with a ratchet and pawl device so that the cutting clearances can be easily set to the thickness to be cut and cutting be effected with a minimum of effort. Sturdy and well dimensioned gear lever transmission gives high degree of efficiency. 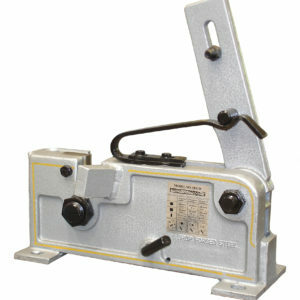 Heavy steel bars can be easily cut by pushing in selector and turning hand lever towards handle. 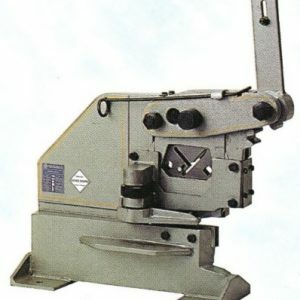 Cutting thin steel bars: pull out selector lever, turn hand-lever towards cutting jaws. 65,000 p.s.i. 100,000 p.s.i. 120,000 p.s.i. Round 40 mm. 32 mm. 29 mm. Square 35 mm. 29 mm. 25 mm. Flat 70 x 18 mm. Size of blade Length 70 mm.